There are many fascinating legends in Langkawi. So I will break it into two blog posts. This is the second post. To read Legendary Langkawi Island in Malaysia (Part 1), see my previous post. 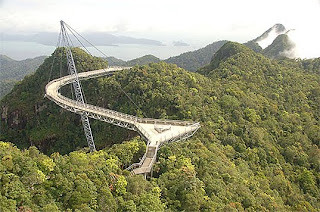 There are two well known mountains in the heart of Langkawi Island, Gunung Raya and Gunung Mat Cincang. Added to the two and appearing to separate them is a hill called Bukit Sawar. The three were said to be human beings with respective names of Mat Raya, Mat Cincang and Mat Sawar. Legend says Mat Raya's son was interested in marrying Mat Cincang's daughter, much to the displeasure of Mat Cincang. The boy was said to be of bad character. Despite the reluctance on Mat Cincang's side, the marriage did take place. But unfortunately a fight broke out during the wedding feast. During the fight everyone became violent and pots and pans were flung at one another. A big pot of gravy (“kuah” in Malay) was broken and the contents spilt on the ground. The spot where the gravy spilt is known as Kuah - now the largest town in Langkawi - and where the pot was broken is a village now called Belanga Pecah (“broken pot” in Malay). A cauldron of hot water was also spilt on the ground and the spot, now a village is known as Air Panas (“hot water” in Malay). The spilt gravy seeped into (“kisap” in Malay) the earth at the village named Kisap. Where the engagement ring was flung became known as 'Tanjung Cincin' or Cape of the Ring. The straits now separate Langkawi from Terutau Island in Thailand. The fight between the two families went on until it was intervened by Mat Sawar. Both Mat Raya and Mat Cincang apologized for the damage incurred. In remorse, they chose to be transformed into mountains, immobile and benign. Soon, Mat Sawar followed suit. If you look at the two mountains today, you will notice that little Mat Sawar Hill is wedged in between, probably to prevent another fight between the two. The marriage turned out to be a prosperous one, for Mat Raya's son turned over a new leaf and became a devoted husband. Cave of Legend (“Gua Cerita” in Malay) is one of the many intriguing limestone caves located in the north east of Langkawi. It comprises of two limestone caves, one above the other and faces the sea. There are a number of legends associated with the Gua Cerita, one of which was related to Merong MahaWangsa in the episode involving the Roman and the Chinese Emperors. The story goes that the Emperors of Rome and China had a plan to marry off their children. The scheme was opposed by the legendary Phoenix (“Garuda” in Malay) who saw the union of the two great powers as a threat to the other smaller kingdoms. The Garuda was determined to stop the scheme. Hence, the Garuda abducted the Chinese princess and hid her in a cave on Langkawi Island. Then the Garuda planned to attack and destroy the Roman fleet commanded by Merong MahaWangsa with the Roman prince on it. Merong MahaWangsa is said to be of mythical origin, the descendents of a minor divinity (“indera” in Malay) and an ogre (“gergasi” in Malay). During the battle Merong MahaWangsa summoned the help of Jentayu, the mythical bird of water. However the Garuda was victorious. During the battle the Roman prince fell into the sea and was washed ashore on the island where the Chinese princess was hidden. He was later found by the princess' maids and the couple was finally united in marriage. Meanwhile the Garuda had thought he was victorious but came to know later that the couple was united in marriage. In disgrace the Garuda vanished itself from the world. There are other places in Langkawi with equally interesting and mysterious legends. The Cave of the Banshee (“Gua Langsir” in Malay) somewhat weird sounding, was believed to be a haven for vampires. The cave with its ghost like appearance immediately strikes a visitor with a semblance of truth to the legend. Tasik Dayang Bunting is a fresh water lake on the island of Dayang Bunting, the second largest in the Langkawi archipelago. Dayang Bunting means pregnant maiden. Look carefully at the picture on the left, can you see the pregnant maiden? There are two versions of the Dayang Bunting legend. 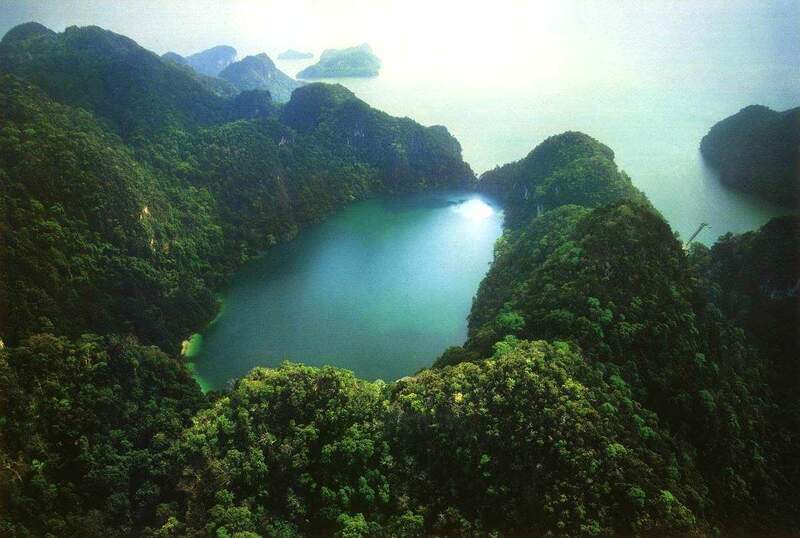 One version has it that Dayang Bunting was a giant guardian spirit that kept watch over the islands. The lady's defenses include her pet lion and poison from the tuba root, potent weapons for her protection. Hence, the two islands closest to Pulau Dayang Bunting, whose silhouette resembles that of a reclined pregnant giant, are named Great Lion Island (“Pulau Singa Besar” in Malay) and Poisonous Root Island (“Pulau Tuba” in Malay). The story goes that, a group of rude merchants failed to pay the obligatory respects to Dayang Bunting as they passed by the islands. Rudely awakened by the intrusion, she summoned her pet lion to despatch the trespassers. She roused the spirits of wind and water, stirring up a tropical storm that unleashed its fury on the incoming fleet of vessels. The howling winds and tossing waves threw and dashed vessels on Junk Island (Pulau Jong), hence the remains of wrecked vessels. In the stormy affair, a cargo of black and white water buffaloes escaped to Land Stable Island (Pulau Gubang Darat) and Sea Stable Island (Pulau Gubang Laut) while the white buffaloes sheltered at White Water Buffalo Island (Pulau Balar). Yet other boats, laden with rice, were stranded at Wet Rice Island (Pulau Beras Basah). All the names mentioned are the true name (in Malay) of the islands around Dayang Bunting. The second version of Dayang Bunting is closely related to the romantic tale of Mambang Sari, a beautiful female genie and Mat Teja, a male genie. Mambang Sari used to frequent the island accompanied by her maids. Their favourite spot was Pasir Teluk Air Tahun and Teluk Lawak. One day Mat Teja saw Mambang Sari and was struck by her beauty. He fell in love with her and follow her wherever she went. Once, while on a lookout for her, he met Tok Diang an old man from the village. Mat Teja told him of his love for Mambang Sari but just did not know how to express his love. He feared that his love might not be reciprocated. She chose to retire at Tasik Dayang Beranak (Lake of Born Maiden) to give birth. Unfortunately the child died after seven days. Saddened by the death Mambang Sari took the child's body and threw it into the lake, Tasik Dayang Beranak. 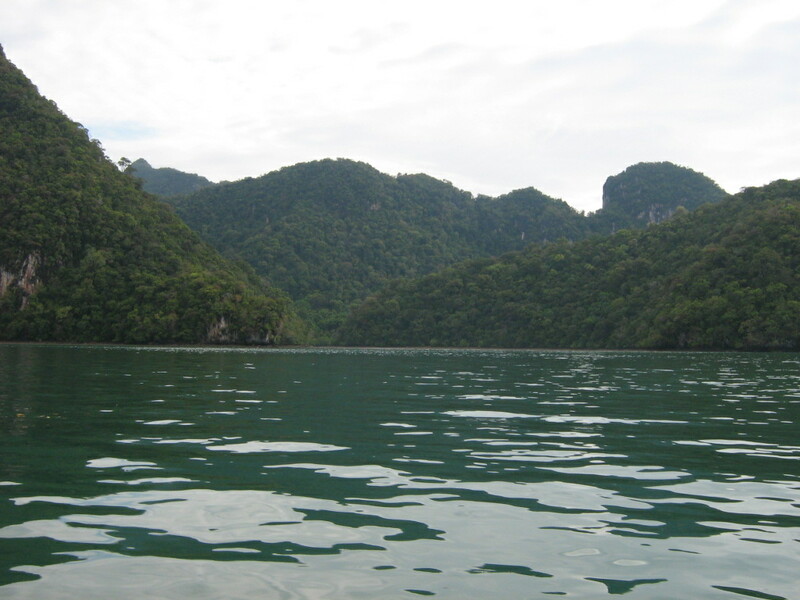 The lake later came to be known as Tasik Dayang Bunting. Many people believe the water of the lake possesses some mystical power of helping barren women to bear children. thats good article, i like it. ..
Mas, Langkawi is a beautiful island. You should visit Langkawi one day.